There are stories you see on the news, in the newspapers, on the Internet, on the radio, and you just shake your head. There’s no way it could possibly be true. It’s just too ridiculous to be based in any sorts of reality. 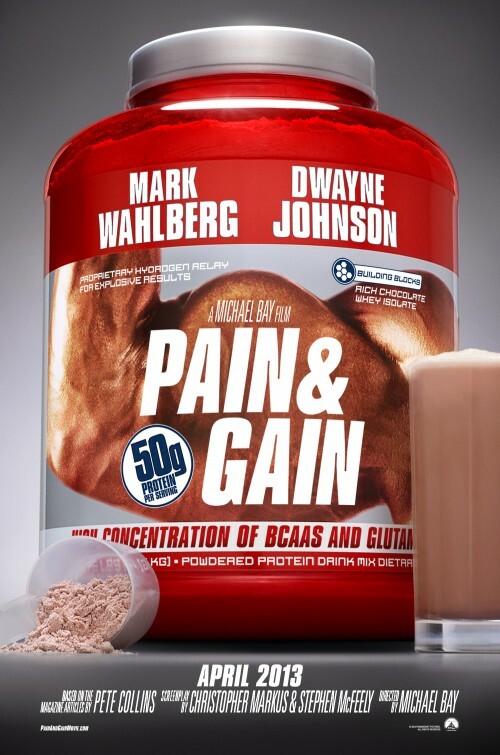 That’s what I kept thinking while watching “Pain & Gain”, a mismarketed film that isn’t what it is was made out to be. It’s got its positives and negatives with an interesting cast and a generally schizophrenic tone. I think I liked it. Think. Working as a personal trainer at a Miami gym and fitness club, fitness nut and budding bodybuilder Daniel Lugo (Mark Wahlberg) wants more. He wants to be successful, to have some money, a house with a lawn. He wants the American dream, and he’s willing to work for it. There’s a problem though. There’s just no easy way to do it….until now. One of Daniel’s clients, Victor Kershaw (Tony Shalhoub), is a self-made man and a bit of a condescending, arrogant idiot at that with lots of money. Lots of money. Daniel comes up with a plan to not only kidnap Kershaw for a ransom, but have the businessman sign over all of his empire; houses, businesses, money, offshore accounts. Daniel enlists the help of two fellow bodybuilders, Paul (Dwayne Johnson) and Adrian (Anthony Mackie), to pull off the kidnapping/robbery. After several bumbled attempts, the trio does it, capturing Kershaw, but these amateur crooks don’t know what they’ve gotten themselves into. From director Michael Bay, this is a movie that defies any real description, a straightforward one at least. What defies logic the most is that this….actually….happened. Read more about it HERE with some obvious spoilers. In Miami in 1995, a gang of three bodybuilders actually kidnapped a businessman and held him captive for almost a full month. I don’t want to give too much away, but the story takes some surprising twists following the kidnapping that I definitely didn’t see coming. ‘Gain’ has everything including kidnapping, ransoms, blackmail, strippers, drugs, murder, extortion and probably a whole lot of other things I’m forgetting. If I didn’t know better, I would have thought this was all made up, the twisted ideas of some warped screenwriters, but no, THIS HAPPENED. Keep that in mind as one bad plan turns into another one here in this bizarrely twisted true story. Michael Bay has never struggled to cast his flicks, and it’s no different here. It’s not that the cast is assembled, it’s that the script gives them a chance to flex their muscles (pun fully intended). Wahlberg’s Daniel Lugo is a very interesting if not at all sympathetic lead character. 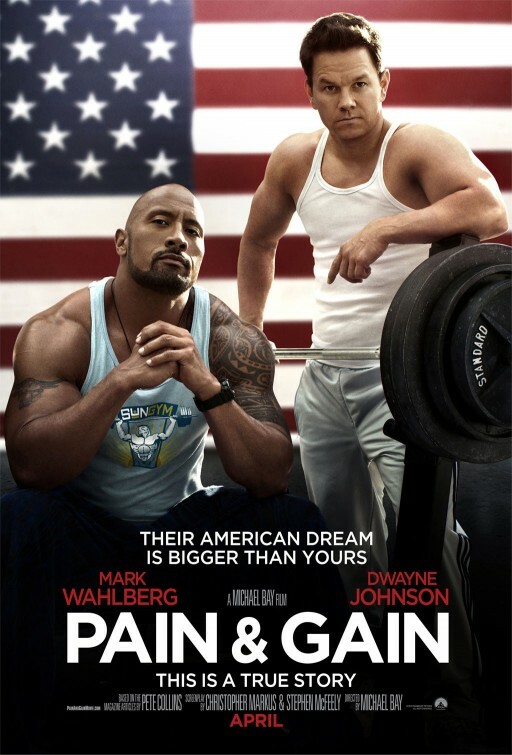 It’s not your typical Wahlberg. He’s fiery and over the top and charismatic, desperately wanting something more out of life. It’s almost unfathomable the depths of how far he’ll go, but that’s just another layer in the surreal quality of this flick. I was equally impressed with Johnson as Paul Doyle, an immensely large muscle-bound bodybuilder with quite the checkered past. He balances out his desire to do what God and Jesus wants him to do….with his love of fighting, punching, strippers and snorting cocaine. It’s a darkly funny part, especially the surprising friendship he develops with Shalhoub’s Kershaw. Mackie rounds out the crew, his Adrian searching and working for the perfect body, falling for a nurse (Rebel Wilson) who helps him with his steroid-induced erectile dysfunction. Quite the trio, ain’t it? Playing the equally shrill, annoying Kershaw to balance out our intrepid heroes, Shalhoub is perfectly whiny as the perpetually shrill, horny motormouth. You can’t decide who’s dumber as the story develops. 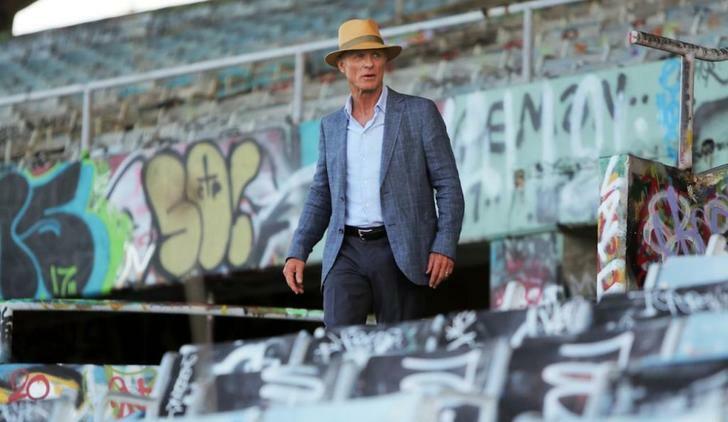 Ed Harris plays Ed DuBois, a retired private investigator who gets caught up in the kidnapping, one seemingly decent person amidst all the shenanigans. Also look for Rob Corddry, Ken Jeong, Bar Paly and Michael Rispoli in key supporting parts. As a director, Bay has a reputation for flicks that are usually far more style than substance (the “Transformers” series, “Pearl Harbor”, “Armageddon” among others). This comedy-drama manages to find a balance between the two. There’s some hyper-fast editing, a visual look full of color and flash, slow motion galore at times, on-screen messages popping up to introduce people, places and ideas, all that good stuff. Maybe it’s because of the frenetic style, but all those different elements worked surprisingly well together. It’s not overdone like so many previous Bay ventures. I thought the best stylized element was the narration, all the characters getting a shot at it at different points during the story. It gives the ensemble a good chance to step into the limelight, none of them disappointing. You really need to know what you’re getting into here. The truth behind the film is ridiculously stupid, sinister, idiotic and incredibly dark. Sometimes just within a scene we see all of those elements. It is darkly funny and takes an out of left field turn near the halfway point of the movie. 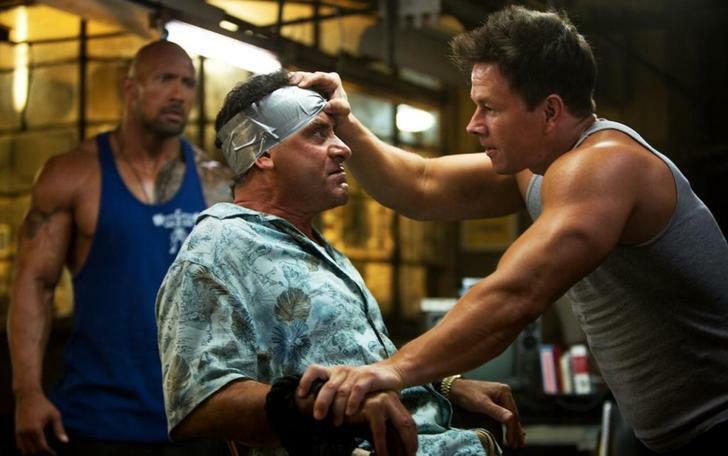 It’s easy to see this Michael Bay-directed movie offending a lot of viewers. I take pride in my really awful sense of humor so I was able to go along with things as they developed. I recommend it, but do your research and brace for a movie you possibly will intensely dislike.